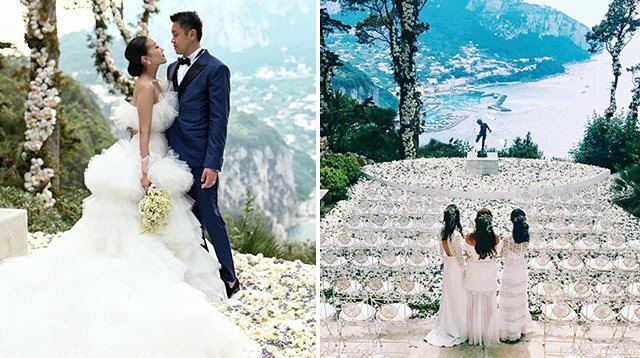 Blogger Feiping Chang and Lincoln Li got married in Capri, Italy. Hong Kong-based fashion and lifestyle blogger Feiping Chang married financier Lincoln Li in April 2017, but the official celebration was held in June. In an interview with Hong Kong Tatler, Feiping explained why they chose to tie the knot in Capri, Italy: "I've always loved Capri—it's one of my favourite summer destinations. It's my happy place. It's a really beautiful and magical spot, and I always knew that one day if I were to get married, I would want to do it there." To take it up a notch, the couple renovated an entire villa: "The government has never allowed a wedding to be done [at Villa Lysis]. It took a lot of work, but we're so happy that we were able to help and refurbish this historical monument. We actually built an entire bridge to link the grounds of the villa to the rooftop." NBD, right? Feiping and Lincoln invited 150 of their closest family and friends. The three-day event included a welcome dinner held at Da Paolino, a trip to Feiping's favorite beach club called La Conca del Sogno, and the actual wedding at Villa Lysis. Every inch of the villa was covered in gorgeous flowers, making it the epitome of romance. Guests indulged in a three-course meal and overflowing wine. They also had access to the dessert room. Feiping and Lincoln's wedding cake was a millefoglie—a traditional Italian cake with layers of fresh cream and wild strawberries.